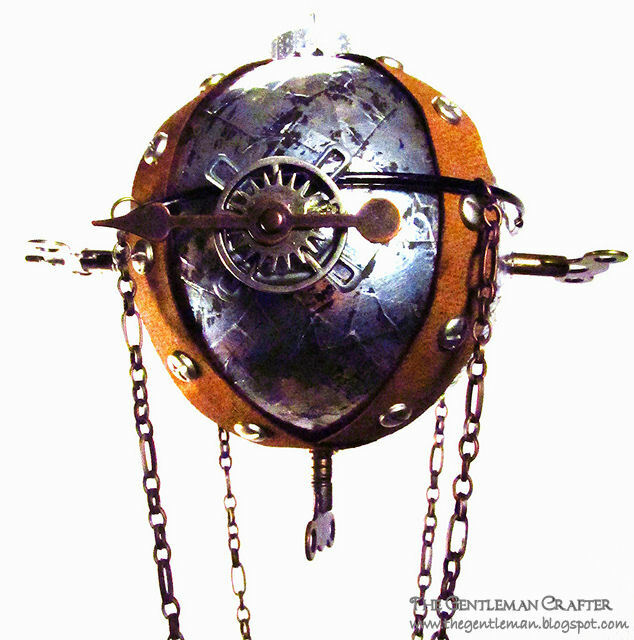 The Gentleman Crafter: Steampunk Airship Ornament! I will be back tomorrow night hopefully with the tuning and touches done and hopefully some kind of tutorial if you are interested. Again, I think another cool project for a man. But for now, here she is on her maiden voyage...The Montgolfier Steampunk Airship...LOL! Hope you all have an awesome week! Thanks for coming by, I so appreciate it! Will you ever run out of ideas Jim lol. Brilliant again! Love it! Don't know how you do it all! I made another flying pig clock for a gift today, so I was busy too. Never enough hours in the day are there? Jim, Jim ... JIM !!! Another way cool project ! well isn't that a cute thing! Love it! it may be manly but I think it's cute! Wow....reminds me of "Around the World in 80 Days"....lol. Very kewl, Jimbo! This looks awesome! Can't wait to see how you're going to improve on it. Magic. So glad I checked back tonight. I love it! Absolutely interested in a tutorial hen you have time.It,s not just that you come up with awesome ideas, it's that you then find a way to make them. No wonder you had to go to Michaels. Your imagination seems to know no bounds! I love this fantastic balloon. Lots of texture, lots of fun details....the little sandbags!!! Just marvelous! Loving the steampunk airship, right up my alley. Would you please share a few words on how you made it? Pretty please? 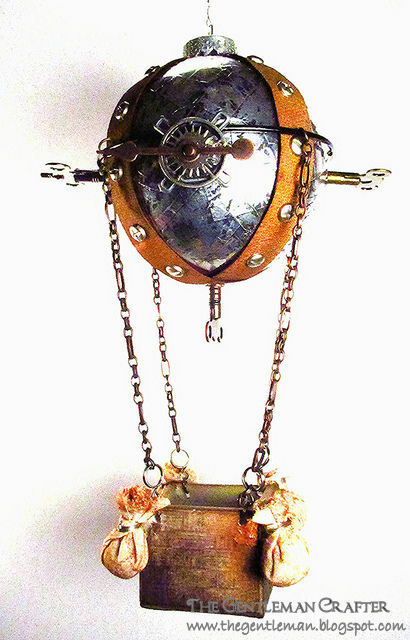 Would love to make one for my scrubbie (scrap hubby) who is into flying things and steampunk style. Cool! Lovin me some Steampunk! Great idea. Never thought to make an ornament into a balloon. Can't imagine how you're going to fine tune and add touches to this. It looks fantastic!!! I'll check back later ready to be amazed. This is so you. I'm sure Santa would Love riding In this to deliver his packages Merry Christmas. Wow Jim, this is so cool! The stuff you make would make nice window and store displays. SPECTACULAR! So weird....I checked your blog before I went to bed...around 11:30pm and there still wasn't a new post. Now this morning it's here and says you posted just before 10pm...weird. Anyway....The Montgolfier Steampunk Airship seriously took my breath away!! So totally C O O L !!!!! LOVE IT!!!! Holy cow Jim, that is awesome! Yes please on the tutorial! You really amaze me, although sometimes I kinda wonder how your brain works. Bet it would be scary to take a peek inside there! Haha! Just kidding, you do incredible work and thanks so much for sharing that "brain" with me! How fun! Love the addition of the sandbags along the side. Wowza Jim! I'm loving the Ornamental Cheerspiration on this! Just magnificent. you have quite the imagination! Oh yeah-you never cease to delight me! Would very much like to see a tutorial please! Love your creations and vid tuts! Wow Jim....is that a christmas decoration underneath there? Another piece of talent. DUDE! Just, dude! I'm at a loss here. That's just freaking cool!!! Did you ever make a tutorial for this? It is awesome! So in LOVE with this ... Fantastic job, Jim!! !